Add a healthy dollop of color to your child’s bedroom with the Kelsic Contemporary Two-Toned Youth Nightstand! The white top and sides help highlight the beautiful front drawer’s colored panel, adding to the appeal. A crystal-like knob drawer pull and an English dovetail construction combine to create a stylish and sturdy drawer for storing bedside necessities. The open shelf provides an additional storage space to ensure your child can keep everything they need close at hand. 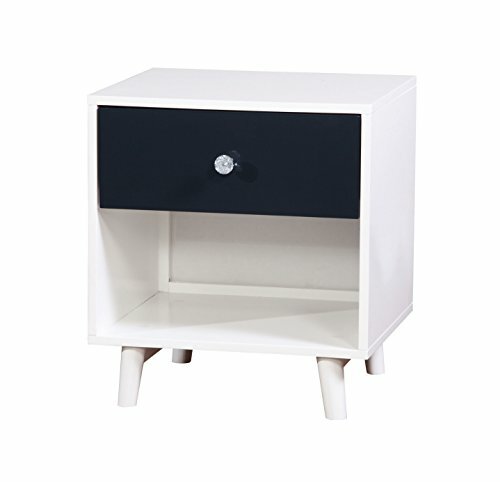 This nightstand is available with a blue or pink drawer front panel. Product frame is constructed from solid wood and wood veneers. Wipe clean with a damp cloth. Assembly required. Spot clean recommended. Minimal assembly required. Product made in Viet Nam. Once assembled, product measures 21 inches high by 19 inches wide by 16 inches deep; 30-days hassle-free replacement parts warranty. Pictures are for illustration purposes. All décor items are not included in this offer. Measures 21"H x 19"W x 16"D.